Happy Wednesday everyone! 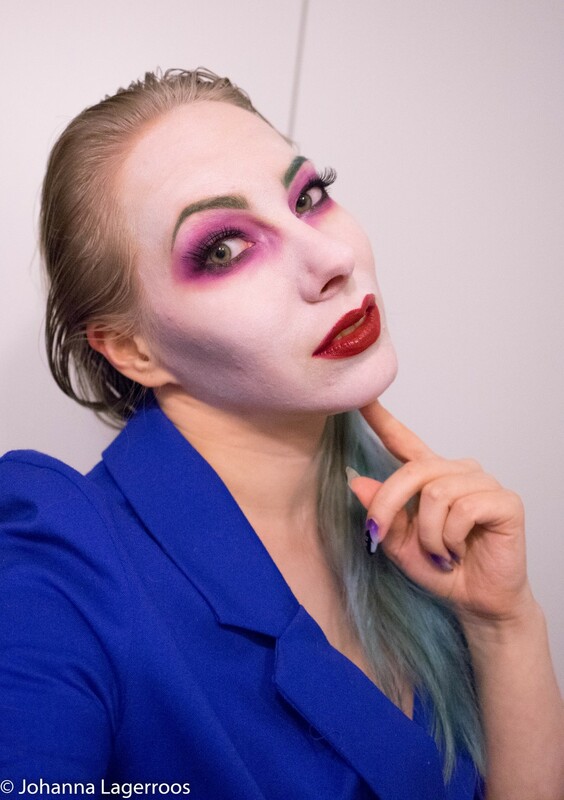 Today, I'm sharing with you a look I wasn't originally going to do, but this called to me more than what I had planned before so... We're going with this look. It's a relatively easy for anyone to do, as with this one you don't have to be super neat or anything, but the messy application can actually make this look better. 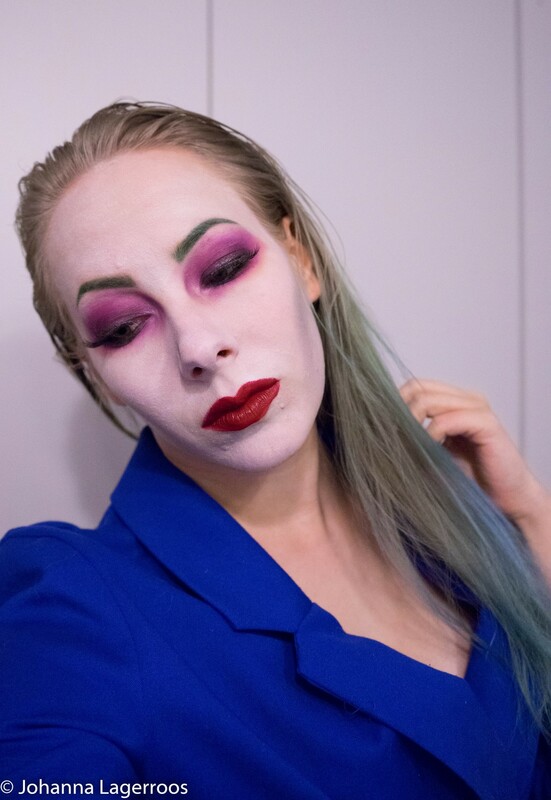 So yes, like the title says, today's look is a lady Joker. 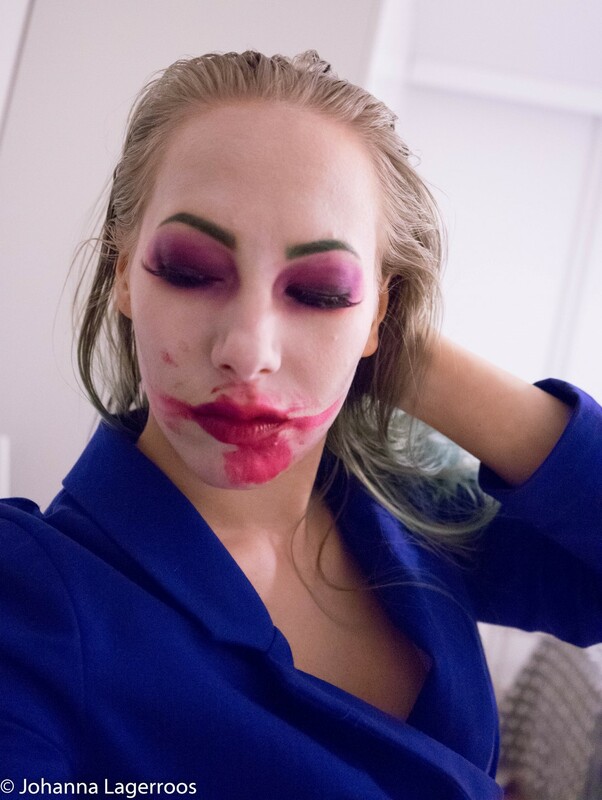 Not to be confused with Harley Quinn, I mean the version of Joker that he would be, if he were a woman instead. And I don't know if I'm allowed to say this as it's my look, but I think I nailed this quite well. 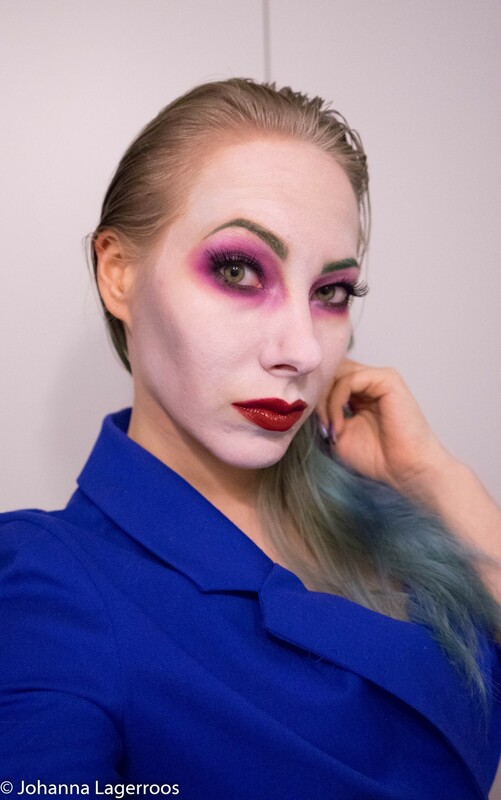 For a look like this, you need a white face paint/Foundation etc. for the base, bit of black or grey to shade the face a bit, green for the brows, couple of purples and a black for the eye look, false lashes and a red lipstick. The palette I used for the bright colors (green brows, purple eyes) is Slush palette by September Rose Cosmetics. 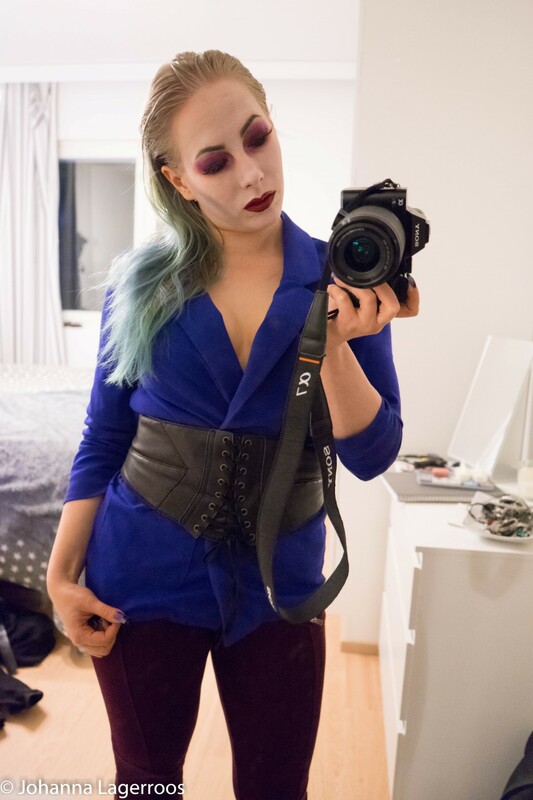 I love that palette so, so much, and I've been using it both in my day to day life as well as for the more creative Halloween looks. 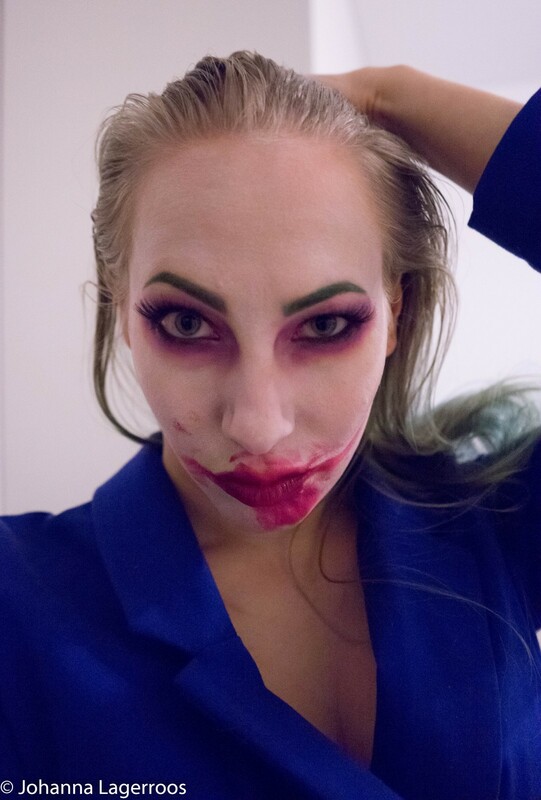 Of course I also had to have the crazier side of Joker, so I smudged my lippie and acted insane. 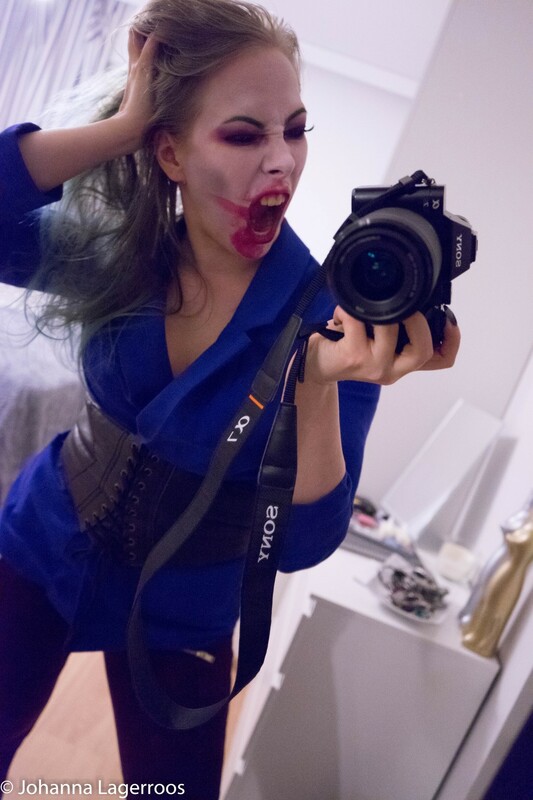 I got to say, that was one of the most fun things with this look, just being a bit insane. How do you think this look came out? Let me know in the comments! That's it for today, and tomorrow, we'll be back at nail art. I actually have a really fun one for you that came out better than I expected, which made me vision some other fun designs to do after Halloween. For more style related content, follow my Instagram @silvertigo, since I post my daily outfits there along with many other things. I'll see you all tomorrow in the next post!